Greetings. I wanted to share with the readers some information about a terrific new book at the Amazon Kindle store. It is called How to Live in a Car, Van or RV–And Get Out of Debt, Travel and Find True Freedom You can also purchase it for the PC platform using Amazon’s free Kindle for PC application (which is how I viewed it – on my netbook). I really enjoyed reading this fun and informative book. 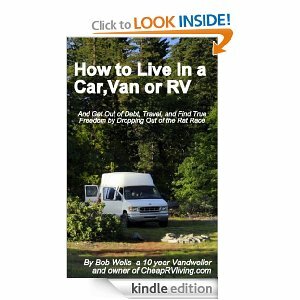 It is written by Bob Wells – a 10 year veteran of vandwelling. Why is this book so good? It is written by an expert – almost if Moses himself wrote a travel guide to crossing the desert. Bob also has a great passion for helping others. There are many aspects of this lifestyle covered within the e-pages. Bob tells us of his background, how he came to live in a van, moved into a house, and wanted to return to “houseless” living. He fell in love (as did many of us!) with this way of life. The author gives the reader a peek into not just the nuts and bolts of why many like cooking with propane and converting a van but into the heart of the kind of person who WANTS to live “houseless”. Bob’s advice and opinions are very sound and mainstream on a variety of topics including which type of vehicle to buy, where to park, bathroom options, what to use for cooking, methods for heating water, how to heat or cool a van, stealth parking, what to do for “house power” etc. He also presents differing points of view (such as butane cooking vs. propane cooking) while articulating his opinions well. All the while, throughout the book there are many relevant quotes and personal stories which will keep the reader engaged. While this book is not an in-depth “how to guide” on such things as wiring solar panels or installing van plumbing, Bob reminds the reader of that. It is a place to get you started, gives you motivation to live in a vehicle, and answers some basic questions. Bob makes reference to his websites such as the Cheap RV Living Forum page where many types of questions are discussed by other vandwellers. It is a place where I also regularly contribute content. Vandwellers like to assist each other! Remember how the pioneers helped each other build homes? We’re not much different. Most of us like helping our brothers and sisters. I thought the book was well put together and liked the flow of it. Bob is a great writer and very upbeat. The editing is quite good. Like any new book, there might be a comma here or there that trips you up but I think Bob’s editing skills are better than my own. Things flow smoothly in terms of grammar, punctuation, and continuity of thought. His voice is so present in this work that if almost feels like you’re sitting at a campfire discussing the benefits of the lifestyle! If you purchase this book, you won’t want to put it down. I’m blurry-eyed and sleepy from reading the whole thing in one night. It is that engaging. Bob’s writing style is interesting, amusing, and captivating. You’ll be hooked. At the time of this posting, sixteen people – including myself – have given this e-book 5 stars on www.Amazon.com. I even offered to my 160 Facebook friends to buy them each a copy if they wanted to read it. Most don’t have Kindle or are not budding vandwellers so it saved me a lot of money. Nonetheless, if you know someone interested in the subject of living in a van, car, step van, utility trailer, SUV, etc. please consider purchasing a copy at the incredible price of $2.99. You can’t even buy a good sandwich or go to a movie for that price! It’s a true bargain. Thanks for visiting and if you get a chance, do check out this book. Bob put a lot of work into writing it and it’s a “must read” for those considering vandwelling or even those of us already living the good life. Once you start reading, you may even notice some stories and references to people you know. Bob’s book, in my opinion, is the finest such work in existence to date on this topic. You’ll be hard pressed to find a better value on a quality publication written by an expert.